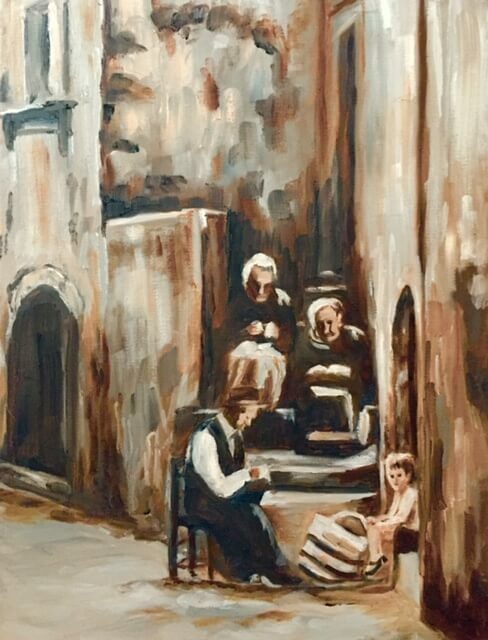 Roots - 12 x 16 - oil - Just as the old photographs that we look back on were developed only in shades of black and white, historic life was also much simpler. Times have changed since those of our ancestors; times where while parents were off tending their land and crops, the grandparents would tend to their grandchildren. Women would care for the home, and would get together to knit new clothing for their families. Stemming from the philosophies that everyone had their role to play in society, and that all had to play their part in order for civilization to prosper and grow as a whole; these are our roots.